Gulf Coast Dance Theater is the non-profit resident performance company of Gulf Coast Dancenter. The company was formed to provide performance opportunities to the dancers who train at the studio or from the surrounding community. The company consists of ballet, jazz, tap, and contemporary, featuring students who have gone through an audition process and made it into the company. In addition to performances around Pinellas County, the company members participate in community service projects. Student Choreography Showcase – Saturday, April 21st @12-1pm. 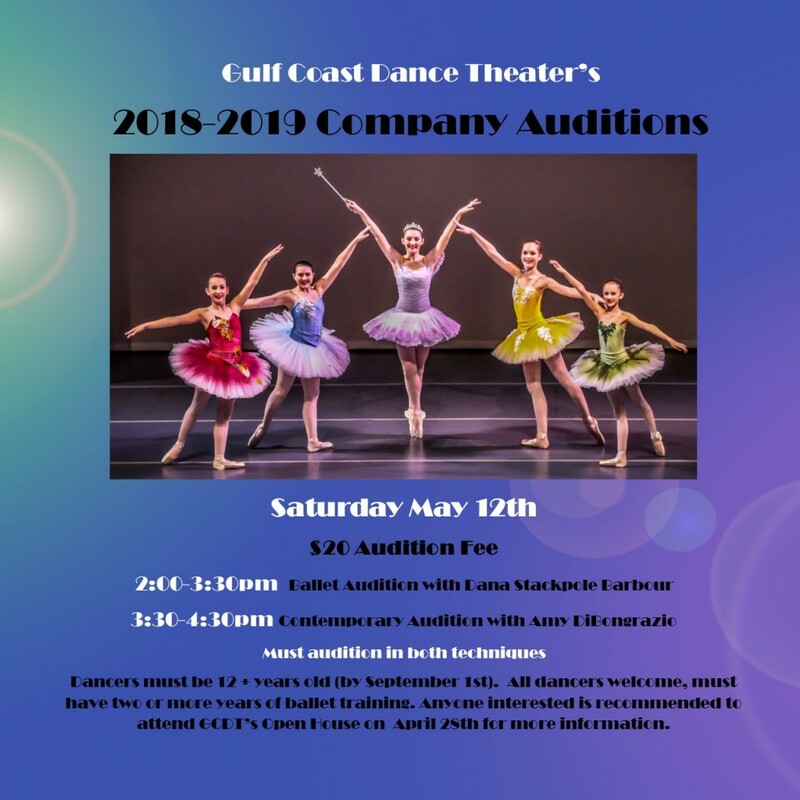 This event will be held at Gulf Coast Dancenter and is open to the studio families. The company members will be sharing their very own choreography creations. There is no entrance cost, FREE! Being a company member of GCDT is a wonderful experience! Our purpose is to expose the dancers to what it would be like to be in a professional dance company, as well as, give back to the community. 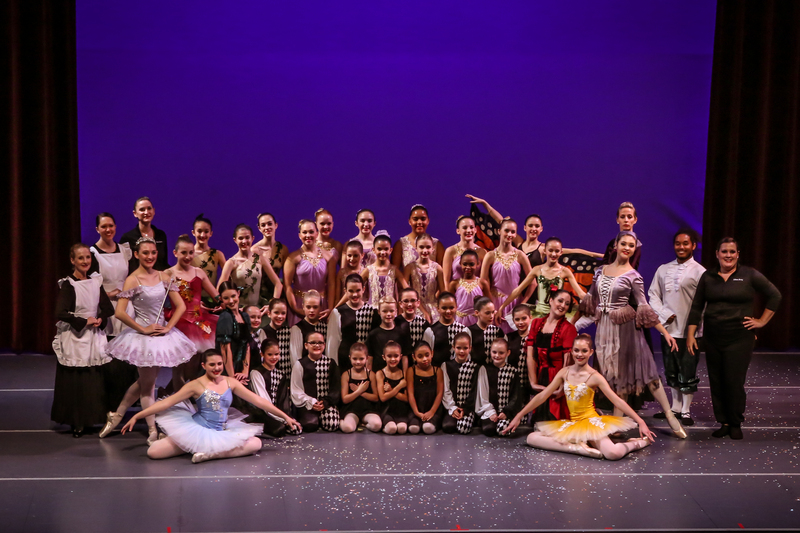 We have two large theater performances during our season (Winter Gala/Cinderella and Alice in Wonderland), many smaller community performances, a student choreography showcase, and community service projects. If all of this sounds like you’d want to be part of it, then please come out and audition on May 12th. MEMBERSHIP FEE: The membership fee is $250 per dance year (Fall 2018 to Summer 2019) or can be divided up into two payments of $125. The membership fees are used to cover costume purchases/use, costume cleaning, props, theater rental, etc. Rehearsal times by teachers will be on a volunteer basis so that all money will be used for the growth of the company. There are no paid positions within the company…100% volunteer base! REHEARSALS: Dancers are responsible to check the bulletin board weekly for rehearsal schedules and other items of importance. Students must attend weekly rehearsals held on Saturdays; if an emergency arises the dancer should speak to his or her choreographer. This may not occur more than two (2) times per the Fall production and two (2) times during the Spring production or it will result in your removal from the show. The dancer is responsible for learning missed choreography prior to the next rehearsal. You must attend all technical and dress rehearsals prior to each performance. 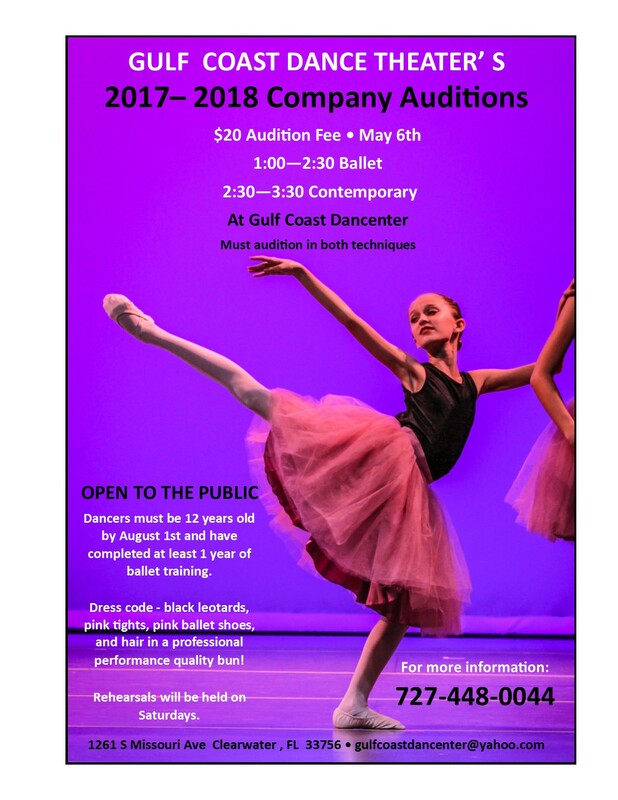 CLASSES: Gulf Coast Dance Theatre members are required to take at least (2) ballet classes and (1) jazz or contemporary class per week. You will only be allowed to perform in the technique of dance that you are currently registered for during your weekly classes. It is strongly suggested that serious dancers take above the minimum requirements as you will benefit from the additional training, in addition, as a representative of GCDT you must participate fully in your classes. If a dancer is absent from (3) consecutive classes (same week, day and time), the dancer and his or her parents will be contacted and he/she may be removed from the current piece. Excessive absence from class will affect future casting in GCDT. If you dance at another studio we will follow up on your registered classes and attendance. ROLES: Although there is an element of competition involved in getting roles, it is important to cooperate and accept the artistic judgment of the Artistic Director. VOLUNTEERING (dancers and parents and/or family members): A Minimum of 18 hours of volunteer commitment from parents and/or family members, will be required for each company member. These volunteer jobs may include backstage set-up, transportation of costumes or props, break down and clean up after shows, costume creation, prop building, additional fundraising, performance promotion, etc.